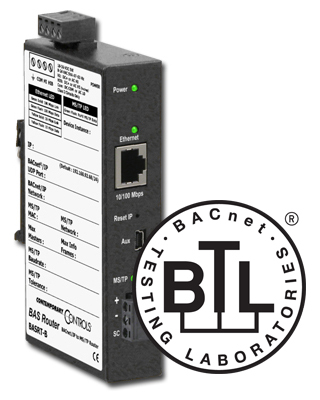 The BASrouter has been independently tested and passed industry-standard BACnet testing and is now BTL Listed for both B-RTR and B-BBMD device profiles. The BACnet Testing Laboratory (BTL) is an independent testing organization formed by BACnet International and BACnet Europe that provides BACnet conformance certification. BTL's requirements for BACnet functionality are based on ASHRAE Standard 135.1P. Products that are BTL listed have been rigorously tested and have passed the industry-standard BACnet conformance tests. BTL tests validate that a product correctly implements a specified set of BACnet features. In the case of the BASrouter, it earned a BTL Listing for both B-RTR and B-BBMD device profiles. Using products that are BTL Listed means interoperability problems are much less of a risk for BACnet system integrators. Because there is a high cost associated with resolving interoperability problems between different vendor's products, many system integrators are choosing to use only products that carry the BTL Mark to lower the cost of system integration. The BASrouter provides stand-alone routing between BACnet networks such as BACnet/IP, BACnet Ethernet, and BACnet MS/TP, allowing the system integrator to mix BACnet network technologies within a single network. Field proven circuit design and up-to-date ANSI/ASHRAE BACnet standard operation provide unbeatable reliability. The BASrouter 3.0 provides built-in BACnet diagnostic capabilities with visual analytics that include an MS/TP status table, routing status table, network error counts, and traffic statistics. The new features allow the integrator to install robust BACnet networks with rapid troubleshooting capabilities that easily identify network issues. Learn more on the BASrouter product page.